Friedrich Nietzsche (1844-1900) was one of the most profound and influential philosophers. Nietzsche, exerts a powerful and enduring influence over modern thought. Nietzsche's writings contain many ideas and concepts such as perspectivism, the will to power, master-slave morality, the death of God, the Übermensch (Overman) and eternal recurrence. He gave many insights into the human character. Nietzsche’s work relentlessly undermines the elevation of ‘literal’ over ‘metaphorical’ truth. He argues that we cannot privilege literal or ‘pure’ truth over metaphor because truth is itself a metaphor that has been invented to lend authority to particular forms of thought and styles of living. He argues repeatedly, for example, that the ‘truths’ of religious teaching are really dominant perspectives upon the meaning of human experience employed to establish the prestige of a community’s way of life (Spinks, 2003). Nietzsche challenged the foundations of Christianity and traditional morality. He proclaimed himself as an "intellectual Nebuchadnezzar," -one who, despite his hostility to religion, serves God's purposes by the depth of his ideas. Although he was critical of a number of religions Nietzsche saw Buddhism as a more realistic religion. According to Antoine Panaïoti the author of Nietzsche and Buddhist Philosophy points out that there is a subtle relationship between Nietzsche's Philosophy and Buddhism. Nietzsche mainly read Buddhism through Arthur Schopenhauer. Schopenhauer was influenced by Indian religious texts and later claimed that Buddhism was the best of all possible religions. Schopenhauer's ethics which are based on universal compassion for the suffering of others can be compared to the Buddhist ethics of Karuṇā. Schopenhauer’s "The World as Will and Representation" made profound impact on Nietzsche. Nietzsche recognized Buddhism as the most mature expression of life-negation. Nietzsche called Buddha 'that profound physiologist' and his teachings less areligion than a kind of hygiene. Also he stated that Buddhism is a religion for the closing, over wearied stages of civilization. Buddhism and Nietzschean philosophy do not deny that the world is characterized by impermanence and illusion. Nietzsche declared the death of God. Nietzsche's credo "God is dead" served as a declaration for the nineteenth century, it became a theological diagnosis. He recognised Buddhism as an atheist religion. As described by Nietzsche goal of life should be to find one’s self. True maturity means discovering or creating an identity for one’s self. Overcoming feelings of guilt is an important step to mental health. As a human centered religion Buddhism does not deny these ideas. Buddhism and Nietzschean philosophy saw emptiness in the human condition. At the center of existence there is a void. This void is the result of the insubstantial nature of life, and the aggregates (Ratanakul, 2004). According to Buddhist philosophy emptiness (Śūnyatā) is a realized achievement. Nietzsche accepted the Buddhist philosopher Nagarjuna’s (ca. A.D. 150- 250) concept of śūnyatā, or "emptiness". The Buddha identified craving (tanha) as the cause of suffering. Nietzsche clearly rails against the pursuit of pleasure where pleasure is understood as a particular sensation marked by the absence of any pain or discomfort. He, for instance, describes Epicurus, who conceived of pleasure (ataraxia) as the absence of all physical and mental discomfort, as representing a state in which one is neither sick nor well, neither alive nor dead. For Nietzsche, pleasure cannot be divorced from pain, rather, they are 'twins' (Urstad, 2010). The Buddha stated that "Life is Suffering". In Buddhism the word suffering (dukkha) has a deep philosophical and existential meaning. In the Buddhist perspective life is characterized by three important traits: conditionality (cause and effect), impermanence, and insubstantiality. Everything is impermanent and changeable therefore suffering exists. It is a universal phenomenon. Schopenhauer's view that suffering is the direct and immediate object of life. We are ironically attached to suffering Nietzsche once stated. Both Nietzsche and the Buddhists take the view that suffering and happiness are inextricably linked (Priest, 2007). Nietzsche’s first book, The Birth of Tragedy out of the Spirit of Music, first published in German in 1872, occupies a curious position in the development of his thought (Spinks, 2003). In The Birth of Tragedy, Friedrich Nietzsche celebrated the dueling forces of reason and emotion as personified by the ancient Greek gods Apollo and Dionysus. In Greek mythology, Apollo and Dionysus are both sons of Zeus. Apollo is the god of reason and the rational, while Dionysus is the god of the irrational and chaos. The Birth of Tragedy, Nietzsche began to grapple with the horror of individual existence. In his work the Gay Science (first published in 1882) Nietzsche posed a question: Has existence any meaning at all? In The Gay Science, Nietzsche experiments with the notion of power (Kaufmann, 1974). In Buddhism, the primary purpose of life is to end suffering and it has become the central meaning. 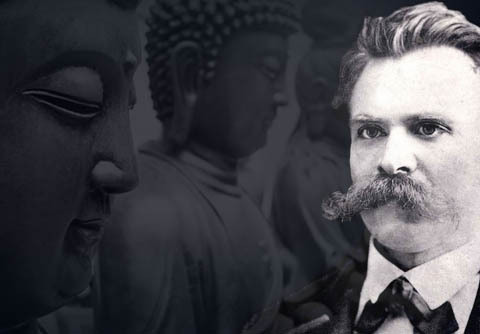 Nietzsche's Zarathustra and the Buddhist bodhisattva concept have some similarities. Zarathustra left his home and the lake and went into the mountains.and has found contentment and enlightenment during his time alone. During this time period Zarathustra has been transformed. Zarathustra advocates a self-asserting individualism. Nietzsche’s prophet Zarathustra is intended to be a model for the modern mind, one free of superstitions inflicted by antiquated religious dogma. Nietzsche claimed that Jesus' death on the cross symblized the beginnings of a Buddhistic peace movement He praised Buddhism for setting out to treat 'suffering' as opposed to sin. Nietzsche wrote that knowledge and strength are greater virtues than humility and submission. However he saw nihilism associated with Buddhism. Nietzsche stated that the Buddhism contains nihilistic belief system. Nietzsche's concept such as will to power do not harmonize with Buddhism. In addition Nietzsche accepted Schopenhauer's depiction of the will to live and the need to overcome the animalistic tendencies inherent in the instincts. The Will to Power Nietzsche describes nihilism as 'ambiguous' in that it can be symptomatic of either strength or weakness. Nietzsche claims that nihilism is a necessary step in the transition to a revaluation of all values. Passive nihilism is characterised by a weak will, and active nihilism by a strong will. Nietzsche emphasises that nihilism is merely a means to an end, and not an end in itself (Vered Arnon). According to Nietzsche a nihilist is a man who judges that the real world ought not to be, and that the world as it ought to be does not exist. Elman (1983) stated that the accusation that Buddhism is pessimistic and nihilistic has been made since Europeans-first came into contact with India. He further states that Max Miiller made this a principal theme in his studies of Buddhism, and this view is still widely held today. Moad (2004) pointed out that Nietzsche's interpretation of Buddhism as a life-negating philosophy that seeks to escape an existence dominated by suffering. According to Nietzsche, Buddhism can be described as an effort, through restraint from action, to escape suffering and pass into absolute non-existence.both Nietzsche and Schopenhauer greatly misunderstood Buddhism by interpreting Nirvana as non-existence. In the Pali canon, the two most famous descriptions of Nirvana both refer to "the unborn," where neither this world nor the other, nor coming, going or standing, neither death nor birth, nor sense-objects are to be found. Nirvana, however, cannot be described as existing, not existing, both existing and not, or neither existing nor not. Nirvana for the Buddhist is not an escape from the world, as western commentators on Nietzsche have continued to argue. In order to make it possible to experience Nirvma, one begins with an investigation into the suffering inherent in life, but the quest does not end with this important insight. The experience of Nirvma is not based on a question of pessimism or optimism. One overcomes pleasure and pain, pessimism and optimism, before beginning a mindful examination of one's self and reality as perceived by the self. Therefore Nietzsche, as well as Schopenhauer, entertained inaccurate views of Buddhism (Elman, 1983). Friedrich Nietzsche could not identify the main essences Buddhism and also he missed the humane part of the Christianity. At the end Nietzsche said : There is perhaps nothing so admirable in Christianity and Buddhism as their art of teaching even the lowest to elevate themselves by piety to a seemingly higher order of things, and thereby to retain their satisfaction with the actual world in which they find it difficult enough to live - this very difficulty being necessary. Baird, R.M. (1987).Nietzsche: An intellectual Nebuchadnezzar.J Relig Health. 26(3):245-50. Elman, B. A. (1983). Nietzsche and Buddhism. Journal of the History of Ideas, 44(4). 671–686. George, D.R. (2013).Shooting at the sun god Apollo': the Apollonian-Dionysian balance of the TimeSlips Storytelling Project. J Med Humanit. 34(3):399-403. Hutton, K. (2014). Compassion in Schopenhauer and Śāntideva. Journal of Buddhist Ethics Vol. 21. Mate,G.(2009). In the Realm of Hungry Ghosts.Vintage Canada. Moad, O.E.(2004). Dukkha, Inaction, and Nirvana: Suffering, Weariness, and Death? A look at Nietzsche's Criticisms of Buddhist Philosophy.The Philosopher 92 (1). Moss DM . (2010).Nietzche's echo--a dialogue with Thomas Altizer. J Relig Health. ;49(1):118-37. Panaïoti, A. (2013).Nietzsche and Buddhist Philosophy. Cambridge: Cambridge University Press. Ratanakul, P.(2004). Eubios Journal of Asian and International Bioethics 14., 141-146. Roberts, M.(2008).Facilitating recovery by making sense of suffering: a Nietzschean perspective. J Psychiatr Ment Health Nurs. ;15(9):743-8. Wilkes, J. (2000). The psychology of compassion. An analysis of the 100th anniversary of the death of Fredrich Nietzsche. Psychother Psychosom Med Psychol. ; 50(6):255-8.